Home > Bank Debts > Is Your Bank Getting You Into Debt? Credit cards, loans and overdrafts are all credit products provided by banks. But these financial products also come with a range of interest fees and charges that can bring significant debts on their own. 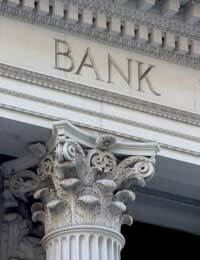 Most banks sell a range of financial products from simple bank accounts to mortgages and household insurance. Loans, credit cards and overdrafts are three of the most popular products supplied to customers through banks. These financial products when used correctly can help to spread the cost of paying for goods and make budgeting easier. But there is a downside if these products are abused or payments are missed. Financial products such as these can bring bank debts through charges, and these can accrue at a rapid rate. Banks sell their financial products with the intention of making money; that is their business. Not only will they charge interest fees on products such as loans and credit cards but there can be hefty penalties and fees. Customers who are late with repayments on credit cards and loans will be charged late penalty fees. Charges will also be applied for missed payments. Interest will also be accruing in addition to these charges. Late penalty fees and missed payment charges are big money earners for banks and lenders in general. Overdrafts can be useful in emergencies or to make ends meet throughout the month. But if overdrafts are abused they can bring incredibly high charges. Going over an authorised overdraft limit will see charges applied. Once this penalty has been applied some banks will actually recharge the fee depending on their terms and conditions. This means that these fees can simply recur and accumulate until money is paid into the account to rectify the situation. Some banks will charge a fee, usually between £10 and £25 every day that an overdraft is over its authorised limit. A media report recently highlighted the problem with incurring charges on an overdraft. One customer of a well known bank was charged £170 after finding she had exceeded the authorised limit by only 8p. These charges accrued on a daily basis and a repayment plan was set up to repay the charges. But charges were still accumulating as the overdraft was still in excess. A year after the first charge the total charges had reached £1700 for exceeding an overdraft by 8p. Bank debts that have accumulated due to charges and fees can have a serious impact on the ability to pay other debts. Many people have had difficulties repaying other priority debts such as rent and utility bills as the banks charges will simply be taken from accounts. Having unmanageable bank debts can also lead to the withdrawal of financial products and the immediate repayment of bank debts. Bank debts can also lead to a poor credit record making future borrowing at reasonable rates a difficult prospect. It is very easy to slip into debt from a few bank charges on credit cards, loans and overdrafts. These debts can accumulate at a rapid pace, especially when there are charges over multiple products. Many people have found themselves in severe financial difficulties due to bank charges and fees. Lenders should be contacted as early as possible to assess the situation if these debts have become unmanageable.